Roasted Almond Oil Hummus - A recipe from Savor California, the online showcase for extraordinary gourmet foods and beverages from California. In a colander rinse and drain chick-peas. Puree all the ingredients in a food processor and refrigerate in a covered bowl. Recipe may be prepared up to this point 3 days ahead. 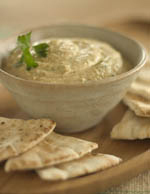 Serve hummus garnished with parsley sprigs and pita toasts.